The Orange guitar amps company got its start in 1968 in London, England. What initially began as gear sell-off to raise some cash has turned into quite a proposition for Cliff Cooper, with many well-known artists using Orange amplifiers. Mr. Cooper actually started the company as Orange Recording Studios, but because the studio couldn't pay the rent, Cooper decided to sell some gear. As legend has it, he would work all hours and sleep at the shop, using a Vox speaker cover as a makeshift sleeping bag. Cliff's background was electrical engineering. He was very interested in offering guitars and amps in his shop, but because other vendors refused to supply him with product to sell, he was forced to draw on his engineering background to design and manufacture his amps. The used gear market helped keep the shop afloat while Cliff established a reputation for Orange guitar amps. He had some help. He was already friends with a little blues band called Fleetwood Mac, who ended up taking Orange amps on a US tour. Within two years, artists such as Stevie Wonder, BB King, Jimmy Page, Ike and Tina Turner and James Brown were fans of the bright orange amps. Orange Music Electronic Company, Ltd. has come a long way since the summer of '68. in 2006, Cliff Cooper received the Queen's Award for Enterprise at Buckingham Palace for his contribution to international trade with the success of Orange guitar amps. Get the full history of Orange Guitar Amps here. Today, the list of musicians having used or currently using Orange guitar amps has significantly grown. You can find these amplifiers being used in every genre of modern music, although rock seems to be the big winner here. Major headliners and up-and-comers are represented as Orange guitar amps users. In addition to the bands/artists mentioned before, some other big names you might recognize are AC/DC, Black Sabbath, Aerosmith, U2, The Pretenders, Slipknot, Alkaline Trio, The Cure, Prince, Fall Out Boy and Rise Against, just to name a handful. As I've said before, when you really like the sound of an artist or band, it's often very helpful to know what gear they use. One of the nice features of the Orange website is the listing of artists that use Orange guitar amplifiers, as well as the exact Orange gear use they use. While it's not complete for every artist, it's worth a look to see if your past or present favorites are there. 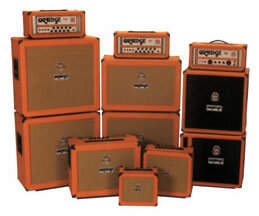 Orange Amplifiers are available in both guitar and bass amps. From the Micro Crush PiX at 3 Watts of output to the 200 Watt Thunderverb Guitar Head, there's a model that will handle anything you've got to dish out. Again, the main concern is tone - do the Orange amps offer the tone you've looking for? Orange traditionally began building tube amps utilizing the popular EL34 tubes found in other major brands like Marshall and Hiwatt amplifiers. Since then, models have been added that allow you to change the output tubes from the stock EL34s (for example, the Rockerverb models). This isn't to say Orange only offers tube amplifiers. The Orange Crush models are Orange's solid state models. These are low cost and great for small gigs and practice. If you happen to prefer built-in digital effects, the Orange crush offers these as well. To test out Orange guitar amps, you can do a search for a local dealer from the Orange website. With any luck, there will be a dealer within a short driving distance. This is clearly the only way you can try one out to see if the tone is to your liking (unless you've got a friend with an Orange). Orange has slowly added vendors to their sales stable. While you can find the amplifiers at many online sellers website's, I'd encourage you to visit your local music shop. If nothing else, it gets you out of the house for a bit and you get to mess around with cool toys! Orange guitar amps are a solid player in amplification and worthy of your attention. Get out there and check them out. They rate up there with other boutique amps, and make a statement for sure with their bright orange covering. Being the "gear whore" that I am, if I had unlimited funds for all the toys, I'd definitely look at Orange Amplifiers for an addition to my collection. ©Copyright 2007-2018 Midlife Rocker Media ~ All rights reserved.